11 Jan 2007 (Vietnam Net Bridge) – A farmer in Nghe An province unearthed the bones of a massive elephant – a megafaunal specimen that could possibly be a mammoth. Yes, I know. Strictly speaking, this might not be considered under archaeology because archaeology is the study of material culture (and not just digging up stuff and cataloguing what you find). But I thought to include it anyway to err on the side of caution. 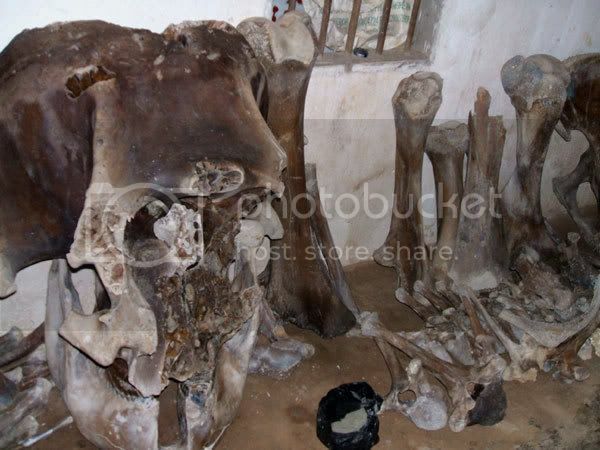 VietNamNet Bridge – A huge elephant skeleton estimated to date back thousands of years has just been discovered in Khe Dinh River by a local farmer, Pham Van Dong, in Hamlet 4, Hong Son village, Do Luong district, Nghe An Province. Dong said that on December 14, 2006 while going to his rice paddy at around 1 oâ€™clock, he saw what he thought was an upright iron wood log sticking out of the river. Finding it unusual, he dug around the place, and to his amazement, amongst layers of mud were more huge animal bones. Immediately, he called his friends and relatives to come and help him with the digging. After nearly 3 days they had dug up a nearly complete skeleton of 500 kg which is in the process of fossilisation. The skeleton has been identified as belonging to a species of enormous elephant and is estimated to date back thousands of years ago, as there is evidence of fossilisation in some of the bones like vertebra and shoulder bones.